WGNS' Bart Walker being inducted into the TN Radio Hall of Fame on Saturday night. 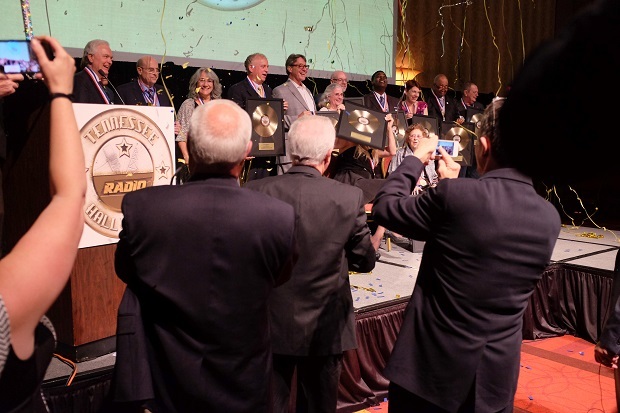 Radio broadcasters from across Tennessee honored twelve persons this past Saturday night (5/14/2016) by inducting them into the Tennessee Radio Hall of Fame. One was from Murfreesboro. That one... Bart Walker of WGNS. This was the fifth consecutive year that this celebration was held in Murfreesboro at the Embassy Suites Hotel and Conference Center. Organization President Gary Beaty said that the State of Tennessee as well as the Federal Government have both proclaimed this entire week at TENNESSEE RADIO HALL OF FAME WEEK. 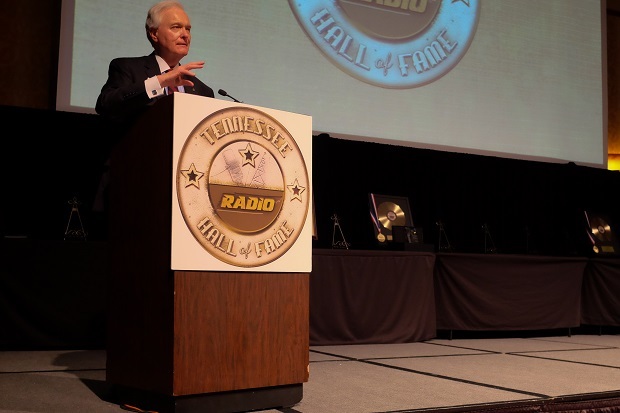 Hall of Fame Treasurer Skip Woolwine told NewsRadio WGNS that once again the Tennessee Radio Hall of Fame was a complete sell-out. 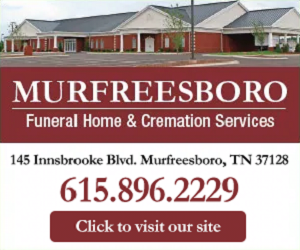 He noted that Murfreesboro City TV taped the event and will feature it throughout the coming month on the city's cable access channel. A video of the evening is also be posted on the Hall of Fame website. 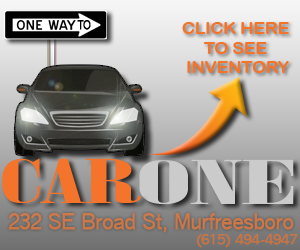 CLICK HERE to visit that site. The emcee for the fifth annual event was Scott Shannon (RIGHT), known as Super Shan. 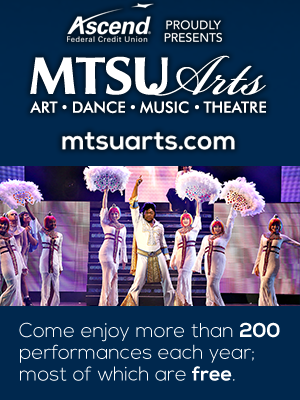 He has deep Tennessee roots in Memphis at WMPS and then to Nashville and WMAK. Scott is now in the Big Apple where he continues to hold the top slot at WCBS-FM and has his own radio network. He has been in New York for quite a while, and took Z-100 to the top slot in the largest market in the U.S.
(Photo below) The 2016 inductees on stage at the Embassy Suites Hotel and Conference Center. 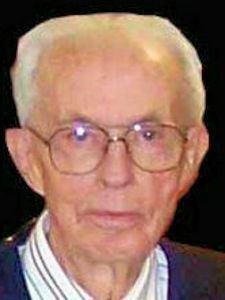 Mr. Medley promoted the idea of a celebration honoring the area's senior citizens. From that originated Dickson County's Old Timers Days festival in 1959. 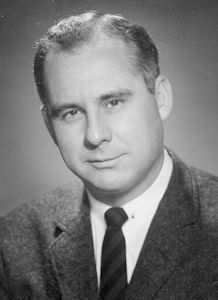 Was instrumental in the creation of the Dickson County Industrial Park, where a road is named in his honor. During WWII at USAAF, produced the National Army Hour over the Mutual Network, and wrote, produced and announced a weekly radio show broadcast from Sheppard Field in Texas. 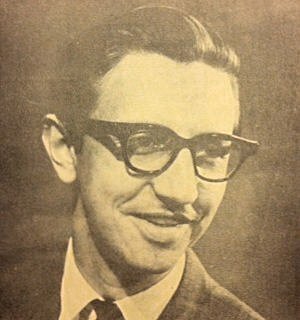 Hired by WSM Radio as sports director and color announcer for Vanderbilt football, Dave started "The Waking Crew" on WSM in 1952, and hosted it for 20 years from 7:45 to 9:00 weekday mornings with a studio audience, full band, staff singers and community news and entertainment. At WSM-TV, hosted "The Five O'Clock Hop," an American Bandstand-style dance TV show, "Luncheon at the Noel," a midday audience participation TV from the downtown Noel Hotel, and a Saturday morning children's show. 1963-1979, emcee and host of the Miss Tennessee pageant. While working at Jackson's Sun Publishing Company and managing the company's Radio Division, he realized what radio stations in small towns could mean in a post war environment. Starting with investors in 1947, within a decade, built a chain of radio stations that included WCMA Corinth, MS; WENK Union City, TN; WDXI Jackson, TN; WTPR Paris, TN; WDXE Lawrenceburg, TN; WDXN Clarksville, TN and WDXL Lexington, TN. 1954 founded WDXI-TV Jackson, TN (now WBBJ-TV). Dixie Network and its Radio Stations were supportive early members of the Tennessee Association of Broadcasters and the Mississippi Association of Broadcasters. Director, National Bank of Commerce. 1953-1954 WSIX Nashville, TN (Staff Announcer, host of "The Tennessee Hay Ride," announcer for "The Pat Boone Show." 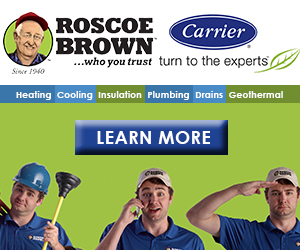 2004-2010 Worked part-time for local cable television stations and spokesman for the Nashville 411 information service. 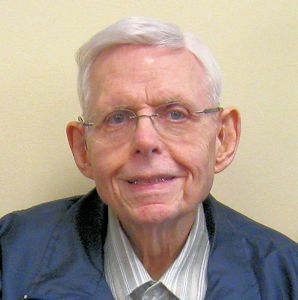 His community involvement included "Handicappers of Nashville" and the American Legion's annual Parade of Pennies providing holiday assistance and disaster relief. Cal was the consummate promoter and showman. Remote broadcast vehicles, a Wild West amusement park on WENO property, mobile searchlight trucks, special events, signage everywhere and in unusual places, and outside-the-box promotions were some of his trademarks. 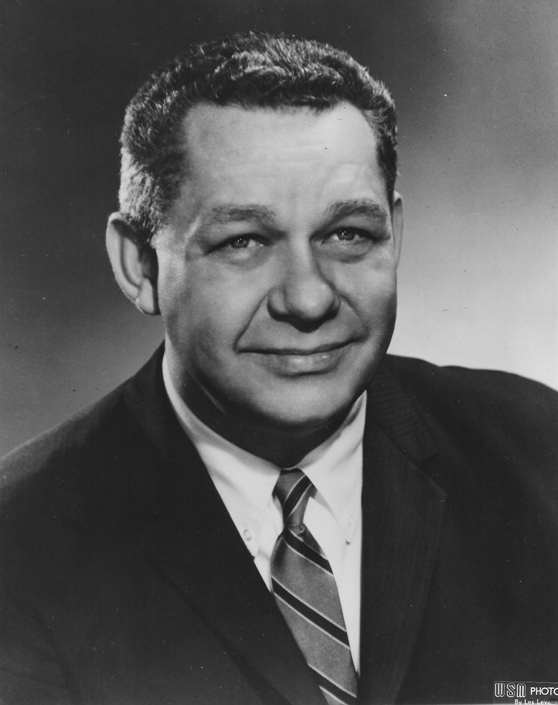 To some, Young was known as, "The white man who brought black music to the Nashville airwaves" with WSOC in December, 1951, Nashville's first station to serve the African-American community full-time, and one of the first in the country. In 1957, WENO was one of the nation's first 24-hour Country Music stations, and the only 24-hour country station in Nashville. WENO was a regular stop for interviews with country music stars such as Eddy Arnold, Jim Reeves, Roy Acuff, Tex Ritter, Roger Miller, Willie Nelson, Patsy Cline and others. 2008 Received the Tennessee Association of Broadcasters' highest honor, the Distinguished Service Award. EarI also served as News Director at WDEF Channel 12 Chattanooga for a period of time in the 1980s. In the 1970s and 80s under Earl's direction, WDOD frequently won awards for breaking news reporting, and in-depth stories. 1981 At the age of 33, Earl was honored by the Tennessee Associated Press as its State Broadcaster of the Year. He is known as a walking encyclopedia of Chattanooga area news and history. For many years, he has spent cold December Saturdays in our busiest shopping areas, doing live remotes to collect donations for the Forgotten Child Fund, a charity in which local fire and police personnel furnish Christmas presents for needy children. Earl is among the riders on the "Santa Train," a caravan of volunteers who deliver presents on Christmas Eve. He has won most of the city's most prestigious public service awards, for his work on behalf of our public television station (of which he is a charter board member), Bethel Bible Village (which provides homes for children whose parents are in prison) and his hometown of Red Bank (a street was named in his honor in 2012). He has been active in Veterans recognition programs, including Chattanooga's Armed Forces Day Parade, which he emceed for more than twenty years. 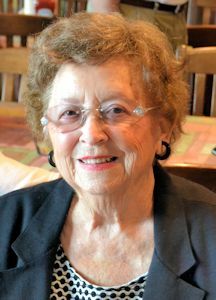 When Maxine Humphreys retired from WGRV in Greeneville on June 17, 2014, she was in her 61st year of broadcasting the 12:30 p.m. news. In all of those years, Maxine had one sponsor - a local funeral home. By the time she switched off her mic for the final time, Maxine had delivered more than 17,000 newscasts - every one of them on WGRV. When Maxine took the job, the station owner, stung by other newscaster's departure after only a few weeks, asked her if he hired her, would she stay for an appreciable time. Little did he know.ALSO:In her early 20s, while her husband was overseas in WWII, she worked in the employment office of the Manhattan Project in Oak Ridge; she worked 27 months for Tennessee Eastman, going home to Greeneville in 1946 - the same year WGRV went on the air. Shortly before she retired, she received a certificate thanking her for helping win the war. 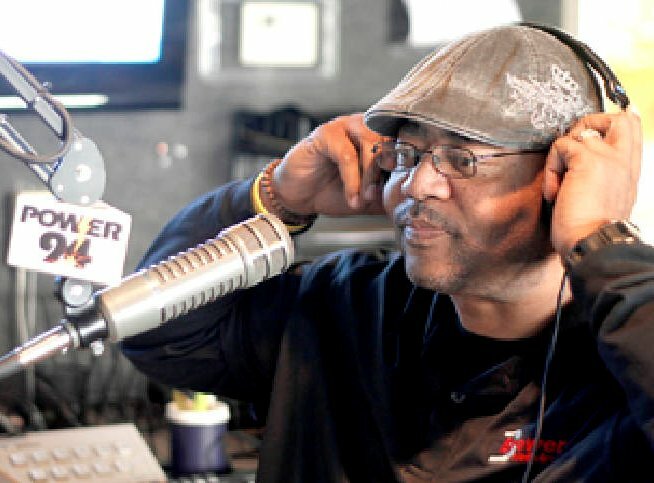 Power 94 has been nominated 5 times as Billboard Magazine's "Station of the Year" and has won or been nominated for numerous other industry honors including the prestigious Marconi Award from the National Association of Broadcasters. 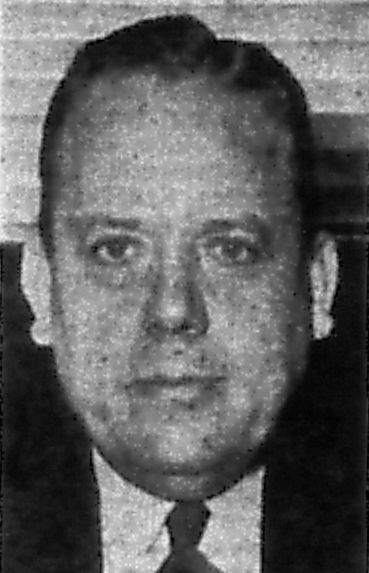 Landecker founded the youth baseball team, "The Tennessee Express". For over 16 years, Keith has fielded and coached at-risk inner city youths on multiple teams, providing equipment, uniforms, transportation, and leadership for "his kids". His league now serves more than 125 youth ages 12-16. Keith was the 2011 Chattanooga recipient of the Jefferson Award for Public Service. 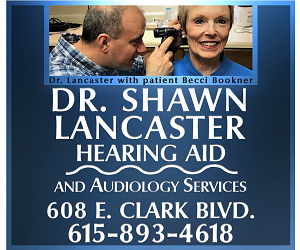 Cathy's done over 12,000 TV voiceovers and 6,000 TV spots on camera for car dealerships, numerous commercials, award show voiceovers, Farm Aid, TNN TV show hosting, Channel 5 entertainment reporter, TV infomercials, etc. Cathy is a founding Board Member of the Tennessee Radio Hall of Fame. Named Air Personality of the Year by the Country Music Association, 1999, 2005, 2010, 2012 and 2015. Named Air Personality of the Year by the Academy of Country Music, 2010, 2016. Named Air Personality of the Year by the Country Radio Broadcasters, 2012 & 2013. Named Music Director of the Year by the Country Radio Broadcasters, 2012, 2013 & 2015. National industry organizations have named US101 their Station of the Year 21 times. Dex joined US101's afternoon drive show in 1994 and his partners have included Big Ole Hairy David Earl Hughes, Jack Cole, Big Al McClure and Melisa "Mo" Wagner. The constant through the last 21 years is that Dex has won his daypart 12+ and 25-54 in every book - 84 consecutive market leading books. He has helped WUSY raise over six million dollars for St. Jude Children's Hospital, and hundreds of thousands of dollars to provide Christmas presents through the Forgotten Child Fund. He's helped raise truckload after truckload of tornado relief supplies shipped from Chattanooga to those in need in Louisiana, Alabama, Florida, Georgia, South Carolina and Tennessee. Dex was instrumental in the formation of the US101 High Noon Saloon which later became the Concert for Hope series, designed to allow country artists to help raise funds for various local Chattanooga charities.Dex took a career detour from radio to work in record promotions with United Artists, ABC and RCA for thirteen years. The fun of radio first hit Bart during Christmas of his 4th grade year when he found a reel-to-reel tape recorder under the tree. He used it to create "really bad radio dramas with monsters and other weird things that a 10-year old would dream-up." By the sixth and seventh grade, he built a low-power AM station which he tinkered with enough to raise the voltage and power to the point that he was twice visited by field agents of the FCC. 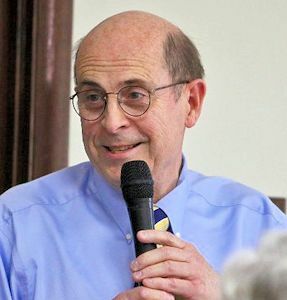 Bart's love for radio grew with the encouragement of WKDA DJ Ronn Terrell (real name: Terrell Metheny), who let Bart pull the news off the teletype, write stories and even cover a few during Friday night visits to his radio show. 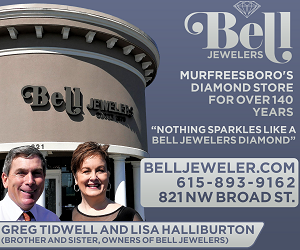 In 1965, Bart became serious about completing his college degree with a move to Murfreesboro to study journalism and English at Middle Tennessee State University. After graduation in 1968, he moved back to Nashville for a year in PR at the Tennessee Department of Education, then 3-years in PR with a Nashville ad agency. In 1984, Walker and Weight Watcher's head Ray Kalil purchased WGNS in Murfreesboro. Later Bart purchased Kalil's share in the station. For its news and community service, WGNS has earned the top Tennessee Emergency Management media award twice and acclaim from the National Association of Broadcasters as well as recognition by the Tennessee Association of Broadcasters. Bart's community service includes Chairman of the Board for the Rutherford County CrimeStoppers, the Heart of Tennessee Red Cross Chapter, Tennessee Association of Broadcasters, President of the Murfreesboro Rotary Club, Elder with Murfreesboro's First Presbyterian Church, board member of the Rutherford County Chamber of Commerce, St. Clair Street Senior Center and Leadership Rutherford. He has been honored with the Tennessee Association of Broadcaster's Distinguished Service Award and Leadership Rutherford's Pinnacle Award. He is a charter member of the Tennessee Radio Hall of Fame. Many persons attempted to purchase tickets, but the gala was sold out. For WGNS' listeners who wanted to attend but could not get tickets, here is the video introduction that played just before Scott Shannon introduced Bart. 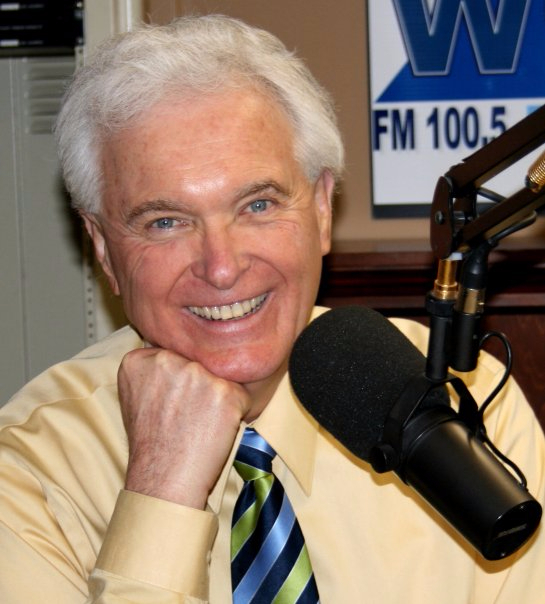 Speaking of the Murfreesboro connection, Walker is not the only Heart of Tennessee inductee, and all of the others also have been a part of WGNS. Earlier inductees with ties to the Good Neighbor Station are Bill Barry, Carl P. Mayfield and John Young. 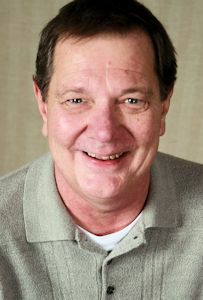 (L-R photo ID) WGNS' Bart Walker, his minister Rev. Dr. John Hinkle, and Lee Ann Walker.